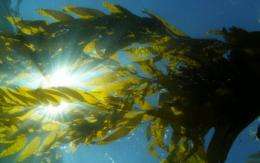 (PhysOrg.com) -- Marine scientists have a new view of the giant kelp in the Pacific Ocean--through a scuba mask and a satellite's "eye." Forests of giant kelp, or Macrocystis pyrifera, are found in temperate coastal regions and are among the most productive ecosystems on Earth. In a melding of data from the beneath the waves and from the skies above, researchers have developed a method for studying how environmental factors affect the kelp forests. The results have allowed scientists to look at changes in giant kelp across hundreds of square miles in California's Santa Barbara Channel over 25 years, from 1984 through 2009. The findings are published in the current issue of the journal Marine Ecology Progress Series. Obtaining a quarter-century of imagery from the same satellite, in this case the Landsat 5 Thematic Mapper, is unprecedented, says David Siegel of the University of California at Santa Barbara (UCSB), one of the paper's co-authors. "A satellite mission that goes on for more than 10 years is rare," says Siegel. "One that continues for more than 25 years is a miracle." Until recently, the high cost of Landsat images limited their use in research. Then in 2009 the Landsat image library was made available at no charge. "In the past, it wasn't feasible to develop long time-series using Landsat images," says Kyle Cavanaugh of UCSB, the paper's lead author. "Once these data were released free of charge, however, we could access hundreds of pictures that show an area over time." Images from the Landsat 5 satellite provided the researchers with a view of how giant kelp forests change over time across a broad geographic region. "Giant kelp forms a dense floating canopy at the sea surface that's distinctive when viewed from above," write the scientists in their paper. "Water absorbs almost all incoming near-infrared energy, so the kelp canopy is easily differentiated using its near-infrared reflectance signal." In southern California, giant kelp is found primarily on shallow rocky reefs distributed in patches. The plants' numerous fronds extend upward in oceans and bays, forming a canopy at the surface. The plants grow to lengths of more than 100 feet, at a rate of up to 18 inches per day. Giant kelp provides food and habitat for many ecologically and economically important near-shore fish and other species, says David Garrison, program director in the National Science Foundation's (NSF) Division of Ocean Sciences, which funded the research along with NSF's Division of Environmental Biology. The kelp is also an important source of food for many deep-sea species. Giant kelp that's uprooted from the seafloor is transported offshore into deeper waters, where it sinks and fuels deep-sea ecosystems with "phytodetritus." Through the recent research, scientists found that giant kelp growth in exposed areas of the Santa Barbara Channel is mostly controlled by large waves. The kelp's growth in more protected areas, however, is limited by low nutrient levels. During winter months, storms in the north Pacific Ocean create large swells that enter the Santa Barbara Channel. Waves breaking during and after these storms are a major source of giant kelp death in this region. Giant kelp is particularly sensitive to changes in climate that alter wave and nutrient conditions. Using Landsat data, the researchers discovered that most years had a seasonal kelp cycle, with minimums in the winter followed by rapid growth in the spring and early summer. This growth in turn led to maximum amounts of kelp in late summer and early fall. Short lifespans of both fronds and entire plants--four to six months for fronds, and two to three years for plants--produce a kelp forest that renews itself six to seven times each year. "We know from scuba observations that individual kelp plants are fast-growing and short-lived," says Cavanaugh. "The new data show the patterns of variability that are also present within and among years at much larger spatial scales. Entire kelp forests can be wiped out in days, then recover in a matter of months." 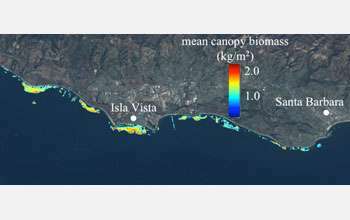 Information collected by scientists at the Santa Barbara Coastal Long-Term Ecological Research (LTER) site, one of NSF's 26 such LTER sites around the world, was added to the satellite data. Dan Reed of UCSB, a co-author of the paper and principal investigator of the Santa Barbara Coastal LTER site, has spent many hours as a scuba diver studying giant kelp. "The kelp occurs in discrete patches," he says, "but the patches are connected genetically and ecologically. Species that live in them can move from one patch to another. "Having the satellite capability allows us to look at how the different patches are growing, and to get a better sense of how they're connected," says Reed. "We can't get that information through diver plots alone." Continued large-scale and long-term observations are needed, he says, to understand how ecosystems--including giant kelp forests--might behave in a future climate. The fourth co-author of the paper is Philip Dennison of the University of Utah.